Dominaria has quickly risen to become one of the most anticipated sets for many people, including myself. I can’t remember a set I was more excited for than this, as it has so much to offer for everyone. For Commander players, there are 42 new legendary creatures to build around! There’s the newly introduced Brawl format that’s exciting a lot of people, and Standard is getting a LOT of new toys, including Llanowar Elves! I guess you could say that Dominaria is a very welcome and exciting addition to the already well developed and loved *saga* of Magic: the Gathering. If you didn’t guess after an entire paragraph just to set up a terrible pun, this portion of the Dominaria set review is about the new card type: Sagas. 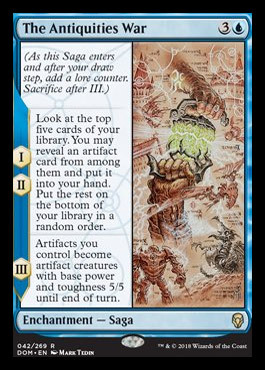 With an entirely new frame design, a completely new mechanic, and a multi-stage effect reminiscent of Planeswalkers, sagas offer a lot of new possibilities for Magic players. While I discuss the mechanics of sagas and what ways we can interact with them, we’ll also take a look at some of these sagas and where they will fit within the Commander format. 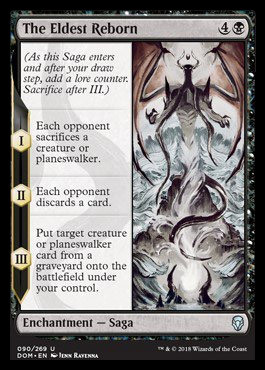 Since the current storyline follows the Gatewatch’s attempts to foil Nicol Bolas’s plans, let’s start with the saga that represents when Nicol Bolas became Nicol Bolas, Planeswalker, The Eldest Reborn. 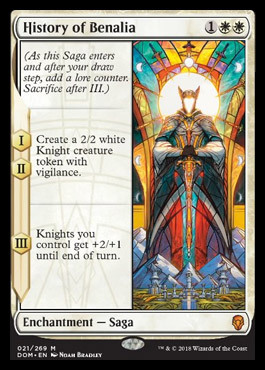 Sagas are all framed this way, with a vertical, full-art piece on the right side, with the card text on the left side and the type line on the bottom. Sagas are a subtype of enchantment, and each saga has three “chapters,” which are differentiated based on the number of lore counters. Each chapter activates whenever a lore counter is put on it, which happens when the saga enters the battlefield, and after the draw step. It starts at Chapter One when it enters the battlefield, and then activates Chapters Two and Three subsequently. Some sagas have the same ability on multiple chapters, but each will trigger individually. However, once the third chapter is activated, whether the ability resolves or not, the enchantment is sacrificed. However, there are some ways to play around with the order in which these things happen. Competitive players are going to find that The Eldest Reborn in particular isn’t very flashy, having a series of decent, but not super-impactful abilities for the board. However, for the more casual player, this can definitely change the tide of the game, as you can potentially steal a huge threat from someone’s graveyard if it stays on the field long enough. In addition, abilities that affect all opponents and not you are always good in commander, and the first two chapters lead into the third one very well! What Makes a Saga Good? The best sagas immediately impact the board once they enter the battlefield. This means that the first chapter should be REALLY good. 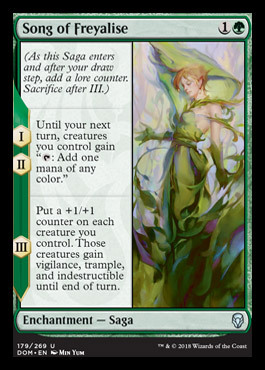 For example, Song of Freyalise immediately impacts the board by causing all of your creatures to generate mana. This one obviously becomes more impactful the more creatures you have, and I imagine will become a staple in many green decks that like multiple creatures, especially due to how it consistently impacts the board with each additional chapter, with an explosive finish. Another example is Fall of the Thran whose first chapter is the most explosive, destroying all lands, while the other two following chapters involve recovering from that destruction. This will fit well into a deck like Narset, Enlightened Master, or Kaalia of the Vast where you don’t necessarily need lands once you have your commander out since you can cheat things into play, and it can still help you recover afterwards just in case. Some sagas have a big effect followed by something small, as mentioned above. However, while those are good, they don’t all have a significant impact on the game after their first ability, as seen with Fall of the Thran. For example, while the initial chapter one ability of The Antiquities War isn’t as explosive as others, it does provide solid value, as does the second ability. In an artifact-heavy deck such as Memnarch, this could help you filter to combo pieces and what you need to end games. The Mirari Conjecture is another phenomenal example of this, as it can let you reuse important instant and sorcery spells. This is going to be right at home in Kess, Dissident Mage and Mizzix of the Izmagnus spellslinging decks. It even has a truly solid final ability, letting you copy the spells you just returned to your hand! 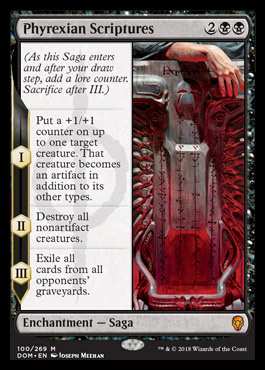 These kinds of sagas are going to be the ones that have a significant influence over the course of many turns, a balance between explosive beginnings and patient ends. This last category of sagas are going to be the ones that require an investment on your part. These are have very powerful finishing chapters, but the earlier ones aren’t as impactful and it will take three whole turns to activate. 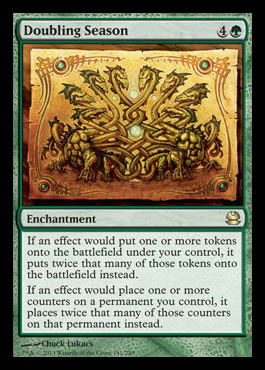 This also means two whole turns of vulnerability to enchantment removal, which is abundant in Commander. The obvious perpetrator of this tactic is Rite of Belzenlok, which is fitting for the rise of an Elder Demon. The first two chapters are very underwhelming, though the third chapter creates an impressive 6/6 flying demon, though it comes with a hefty downside. 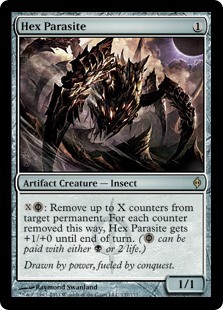 Creatures like this with absurd power and abilities with downsides are truly amazing in formats like Limited or Standard, but aren’t commonly seen in Commander. This is due to the general lack of combat in the format, as well as the high life totals, which might limit it’s presence in EDH. Now something like The Flame of Keld, has a pretty huge downside for its first chapter. Discarding your entire hand can put you in a really difficult spot, but if you know that you can withstand two turns with your current boardstate, and win when the final ability activates, then this saga could be really good in your deck! This is especially true if you can skip ahead of the steps, by discarding your hand and drawing two cards in the same turn. Let’s take a look at how this would be possible. Among the many tools we have at our disposal for messing with sagas are counters. There are two possible ways you can go about this: adding counters or subtracting counters. Any of you Atraxa, Praetors’ Voice players will be familiar with a great way to add counters, using the proliferate ability. Proliferate can escalate our sagas an extra stage each turn or, potentially, go through an entire saga within the course of a turn. One of the best examples of capitalizing on this ability is found in Phyrexian Scriptures. Let’s take a look at it and an example combo piece. Phyrexian Scriptures can be devastating, especially against Commander decks that rely heavily upon graveyard recursion. It’s good enough by itself, but with additional help can completely change the tide of a game. If you have eight available mana and Contagion Engine on the field, you can play Phyrexian Scriptures, activating its first ability. Using the Engine’s activated ability you can proliferate, destroy all non-artifact creatures, and then immediately proliferate again, exiling all of the destroyed creatures. Normally players have a full turn cycle to interact with their graveyards after a board wipe, but this can prevent that entirely. By now you’re probably thinking about the most well-known counter combo piece in Atraxa, Praetors’ Voice, Ezuri, Claw of Progress, and many other Commander decks, Doubling Season. Doubling Season is interesting, as it will only affect the enter the battlefield ability. This means that, with Doubling Season out, any saga that enters the battlefield will immediately go to chapter two, while also triggering the chapter one ability. This can be very beneficial for many of the sagas, such as The Mending of Dominaria. Mending is another saga that has identical Chapter One and Chapter Two abilities. However, this saga is best the faster it goes off, and will hit both of those chapters immediately thanks to Doubling Season. 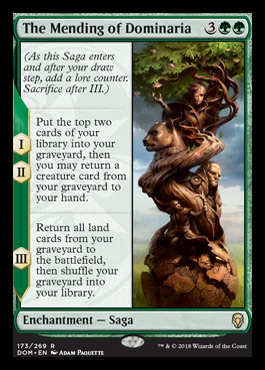 This saga seems to be a generically good card, and I imagine that it will see some play in Commander, due to its utility in bringing back important creatures. If you have a combo relying on two creatures that have individually been killed, you can bring them back easily with this saga. Its ultimate is reminiscent of Splendid Reclamation and Elixir of Immortality which will probably give it some significant use in decks that rely on self mill. 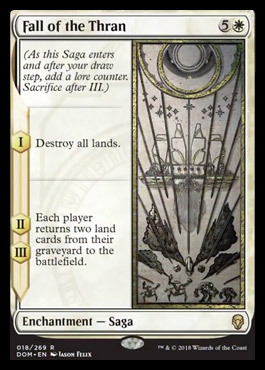 It also has a spicy interaction with Fall of the Thran, where you can destroy all lands and then bring them all back with this (if planned correctly). One of the issues with Doubling Season is that it can ruin some sagas. For example, as we said, Song of Freyalise is a fantastic saga due to its impact on board states, but the faster it progresses, the weaker it is. You’d rather have two instances of that first ability than both instances on the same turn. One of the things that instantly caught my attention when looking at sagas was the potential of keeping them longer on the field than initially intended. This can be done in two ways: flickering them or removing lore counters. Let’s start off with flickering. The flickering strategy is aptly named from the card Flicker. Exile and then bring back the enchantments to start them over again. 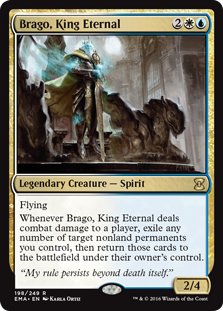 It’s a pretty simple strategy for reusing sagas, and one that a commander like Brago, King Eternal will be very happy to employ. The strategy of removing lore counters involves using the first or second ability multiple times. This will be beneficial for sagas such as History of Benalia, where the payoff at the end depends on using those previous abilities. In this case, it isn’t going to be very helpful to buff your knights in a Commander game when you only have two of them, so you may want to use those early chapter abilities repeatedly. You may also find this to be the case for Song of Freyalise. The first two chapters both increase your mana drastically, and you may want to wait a few more turns before you decide to use the final ability. An important thing to note is that once the third counter is placed on the saga, you cannot remove a counter in response to prevent it from sacrificing. The saga is sacrificed as part of the ability. 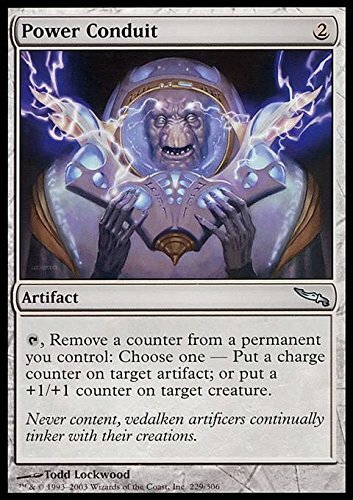 There are many cards that allow us to remove counters in this way, though the most successful is Power Conduit, which has the bonus of pumping up creatures as well. Hex Parasite allows us to start over with the first chapter by removing two counters, which can be great for something like The Mirari Conjecture to repeatedly get back instants if necessary. For you Brawl and Standard players, Quarry Hauler is a Standard-legal card that can either move the saga forward or backward. 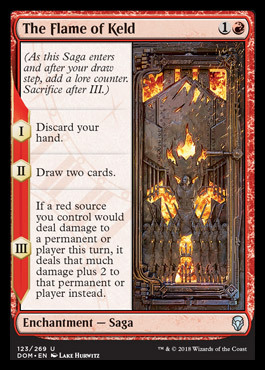 To finish off this set review, I think it needs to be mentioned that while we are discussing these sagas in the context of Commander, sagas were pretty clearly intentioned for other formats. Especially among casual players, we have gotten used to huge flashy things happening, lots of weird combos and fun shenanigans that do huge things. 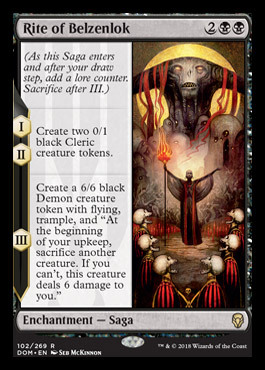 Sagas are REALLY cool in concept, but their abilities are more suited to lower life totals and more aggressive formats. However, if you build a deck with all of these in mind, the potential to capitalize on these enchantments can work, especially with commanders where you are already working with counter shenanigans! I know I’m definitely excited to see which of these will fit into my decks! While getting a degree in evolutionary biology, Christian spent all of his free time in college building commander decks after being introduced to the MTG in the Theros block. After spending the last several years building and playing biologically-themed tribal decks and surprising people with wonky builds of well-known commanders, he decided to share his thought and design process with the community, incorporating ideas from his many playgroups into articles, while also spending way too much of his life underwater. Find him on twitter @Evol_Leap!